Demolition Of Timbuktu's Cultural Sites Spurs War-Crimes Trial At The Hague : The Two-Way "Humanity's collective conscience was shocked by the senseless destruction of its common heritage," a prosecutor says. "Words of condemnation are not enough." French and Malian soldiers patrol next to the Djingareyber Mosque in Timbuktu in 2015. Several of the city's historic and cultural sites were demolished in 2012, during an occupation by Islamist militants. In what's believed to be a first, the International Criminal Court in The Hague is contemplating a case that treats the destruction of cultural heritage as a war crime. The charges date to 2012, when Islamist militants attacked UNESCO world heritage sites in Timbuktu. Today's hearing is to confirm that the ICC's prosecutors have enough evidence to try a reputed leader of the group that seized a portion of northern Mali and destroyed irreplaceable buildings, manuscripts and other items in the summer of 2012. One of the city's most notable and largest landmarks, the Djingareyber Mosque, escaped destruction. 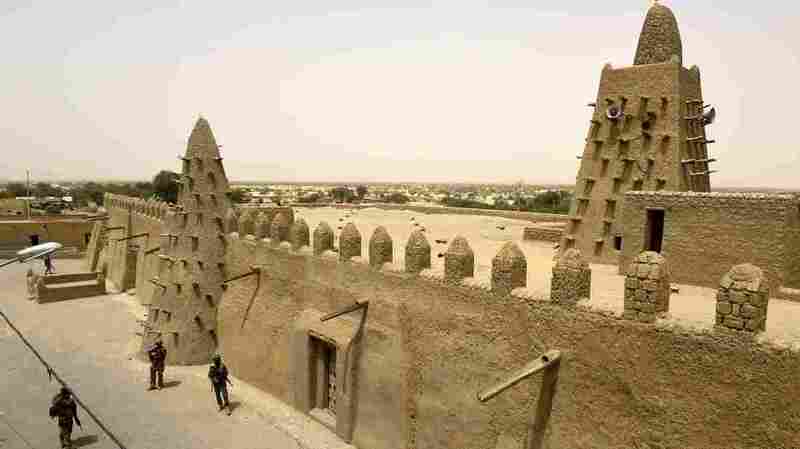 But another of its famous mosques was destroyed, as were shrines that had stood since Timbuktu's golden era during the Mali empire, when the city was a thriving commercial hub and a center of Islamic scholarship. "The ICC usually handles cases alleging massacres, recruitment of child soldiers and other human rights abuses. But now ICC chief prosecutor Fatou Bensouda wants war crimes charges against alleged Islamist leader Ahmad al-Faqi al-Mahdi for destroying 15th-century shrines, a mosque and ancient documents in Timbuktu." "Bensouda is asking ICC judges to confirm she has enough evidence to try Al-Mahdi for crimes against humanity." "Humanity's collective conscience was shocked by the senseless destruction of its common heritage," Bensouda said today. "Words of condemnation are not enough." Al-Mahdi, who is also known as Abu Tourab, was present for today's hearing; he was transferred to The Hague last September. He's accused of being a leader of an al-Qaida-linked rebel group. 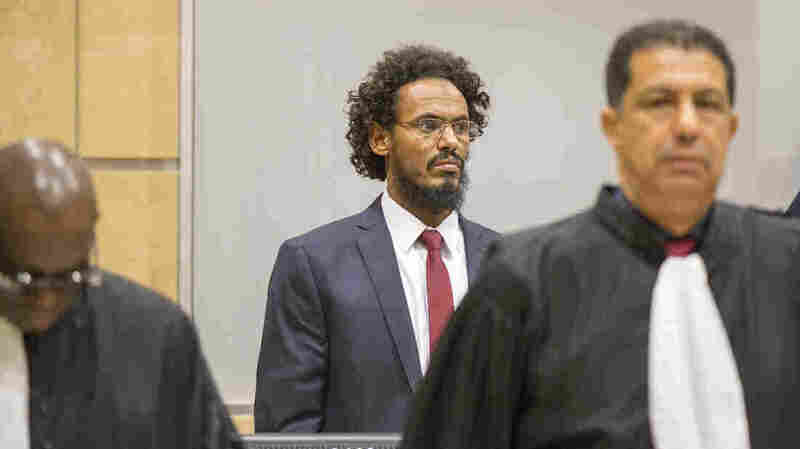 Accused jihadist leader Ahmad al-Faqi al-Mahdi, seen here in September, faces a trial at the International Criminal Court for crimes against humanity. In January of 2013, French and Malian troops defeated the Islamist fighters and were welcomed into Timbuktu by cheering crowds. But even as that liberation was taking place, the fleeing Islamists set fire to a library that held manuscripts dating back to the 1200s, written in languages from Hebrew to Arabic. The violent occupation also brought a severe drop in tourism, which had been the third-largest revenue generator in Mali's economy. "Ancient Timbuktu also had two things that the rest of the world wanted: salt and gold. "While rock salt was a valuable commodity for African traders, it was the gold that interested Europeans. And a 14th century Malian king named Mansa Musa gave Arabs and Europeans their first glimpse of just how much gold Timbuktu might have. "Musa passed through Cairo in 1324 en route to Mecca, and his entourage spread around so much gold that its price in Egypt reportedly crashed for the next decade. Timbuktu became known as a sort of El Dorado of the Old World, says Shobana Shankar, a visiting professor of history at Georgetown University."